Family-owned and operated since 1998 by Joseph and Marilyn Tropea, Sunset Cove Marina offers services and facilities for boating and fishing enthusiasts. These include seasonal and transient dockage, boat shrink-wrapping, storage and winterizing, launch ramp, fishing boat rental, gas bar, boat repair and more. 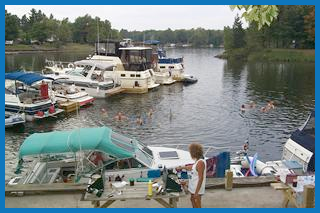 We're located in Bolsover, on the Talbot River, with easy access to Canal Lake and Lake Simcoe. Nearby towns include Beaverton, Kirkfield and Orillia. Boaters travelling the Trent-Severn Waterway or "The Great Loop," have found more than just a marina. With hydro and water at the docking slips, deep water, barbecues on the deck, shower facilities and a pet-friendly environment, Sunset Cove Marina has built a reputation for hospitality. You know you have arrived at the marina when you see the bright red roof. We are proud to announce that soft launch of our new website. Since we're currently reviewing the information please note that the pricing currently listed may not be final and is subject to change. Check the weather in our area or the forecast for destinations along your journey.